Now in some ways I’m not surprised. I haven’t played Star Wars Galaxies (which first launched in June of 2003) since 2006. I’ve written in some detail about how much I loved the early version of the game, a love only surpassed by my dislike of the so-called “New Game Enhancements and my disappointment at watching the game turn into a shadow of its former glory. My very first experience with MMORPGs probably ruined me for life when it comes to appreciating other online games. I played around a bit with MOOs and MUDs but wasn’t really into the idea of online gaming during the Ultima Online and Everquest period. I did play what was then called World War II Online (now called Battleground Europe, and still going despite being the most punishingly unrewarding (which, according to the masochistic logic of most gamers, doesn’t mean it wasn’t/isn’t fun!) game I have ever played. EVE is a game of checkers by comparison). My first experience of a large scale MMORPG was therefore Star Wars Galaxies. It was 5 years ago, in November of 2005, that Sony Online Entertainment scrapped the first version of SWG and implemented the New Game Enhancements (NGE). I stuck it out for a few more months, and then joined the horde of rats scurrying down the anchor chain. When I started playing SWG I was utterly and completely hooked, sold on the idea of virtual worlds from the moment the tutorial (an embarrassingly primitive affair which featured the now infamous “dancing Imperial Officer”) dumped me outside the spaceport in Coronet on Corellia. I hadn’t even got my bearings when there was a peal of thunder and it began to rain. That is exactly how long it took me to part with my immortal soul. Naively, I assumed that SWG was like every other MMORPG out there in its basic mechanics. It wasn’t. Now is neither the time nor the place to rehearse the reasons for the game’s self-mutilation that left it little more than a WoW wannabe. . . Oh hell, who am I kidding, any time is the perfect time to discuss such idiocy. 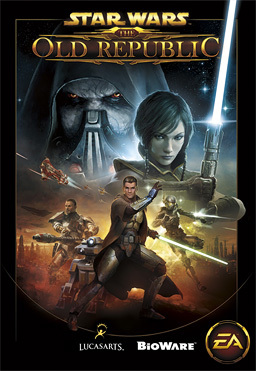 In retrospect, after playing several other MMOs of various kinds, I’ve come to realize that the reason SWG made such an impression on me is not simply because it popped my MMORPG cherry, but because it was trying to be a kind of game that is still strikingly rare in the MMORPG marketplace: an adult game. What follows is part reflection, part elegy, part rant, all in memoriam for one of the most promising MMORPGs never to last the distance. But my purpose is a serious one. SWG‘s failure raises numerous issues, but the central one is an issue that still plagues the MMORPG industry: the unwillingness of developers to stop pandering to those players who want childish games. The Huddled Masses, Yearning to be Free? In an interesting development last week, the MMORPG Pirates of the Burning Sea announced that it was going to transition to a Free-to-Play model. Appearing on the same day as the release of the Power and Prestige expansion (that, among other things, allows players to run for Governor of the various ports in the Caribbean, to set taxes for other players, and adjust port expenditures on defense and economic infrastructure) the announcement took a lot of players by surprise. There is currently no timeline for the change from a subscription-based business model to that of F2P but Flying Lab Software (FLS) has made it clear that they have been working on this for the better part of a year, that the infrastructure is in place, and they expect the change to take place quite soon.